Neurofibromas contain variable amounts of mucinous stroma and collagen in addition to the cellular elements (neoplastic Schwann cells, axons, EMA+ve perineurial-like cells, fibroblasts, CD34+ spindle cells, and mast cells). 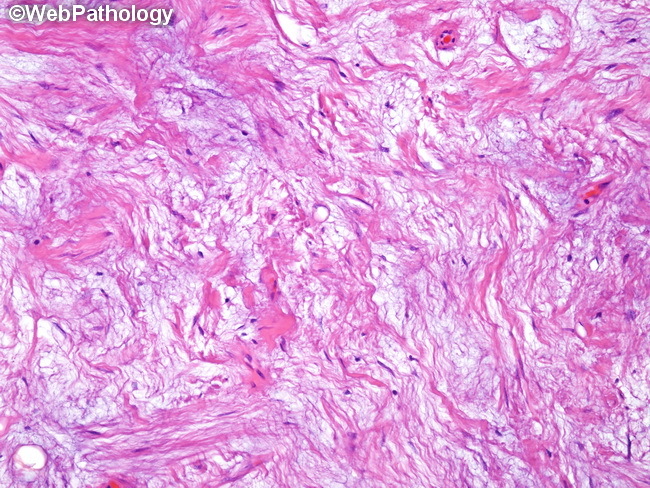 Some cases are hypocellular and contain sparse number of Schwann cells scattered in a highly myxoid stroma (myxoid neurofibroma). Such cases may be confused with myxoma or myxoid liposarcoma. Features supporting neurofibroma include greater degree of orientation of neoplastic spindle cells, prominent vascularity, and the presence of organoid pseudo-Meissnerian structures.